Definition of yoke: a device for joining together a pair of draft animals,especially oxen, usually consisting of a crosspiece with two bow-shaped pieces, each enclosing the head of an animal. I just can't seem to get this verse out of my mind lately. I have been reading the book of Matthew for a couple of weeks now and have been asking the Lord to show me "Jesus". I yearn to understand, grab hold of and rediscover everything there is to know about God's Son. I have also been very aware of the great burdens that others and at times myself are carrying without truly understanding the concept of who Jesus wants to be to us in those times. So Matthew 11:28-30 has been where I have camped lately. When you look at the picture above of the two oxen....you notice that one is smaller than the other. I choose this picture to represent Jesus and ourselves walking side by side. 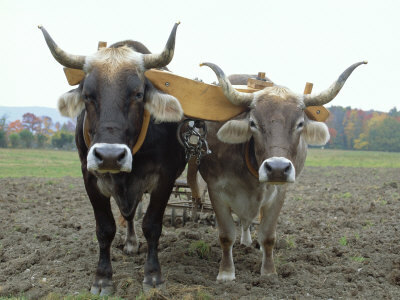 Many times farmers will put a smaller oxen right next to a larger, more experienced oxen so that it will learn how to pull and handle the load that it is carrying. The younger bullock which is smaller in size doesn't necessarily pull any weight...it merely is learning how to walk in a field under control, harnessed to a partner. The big ox will pull all the weight and set the direction for the younger one, whose only responsibility is to walk alongside and learn. Can't you see the vision of this happening in the verse in Matthew 11 ? Jesus said that those who bound themselves to him would not bear a heavy load!! This is huge! Jesus is our "Burden Carrier"....all we are to do is hand them over to Him and learn from Him. Notice however, that our responsibility is to "learn". Be intentional about watching and learning about our "Burden Carrier". The more we learn about Jesus in this area of our lives, the easier it will be to bring all of our worries, burdens and cares to Him each day. Jesus knows how tired we are of carrying heavy burdens all by ourselves. We were never created to carry those BY OURSELVES! Our body's, minds and souls are not made for that. We hear all the time what stress does to a persons body. Jesus calls us to come along side of Him, take His yoke and learn of Him. learn how to carry such a load. Jesus as our teacher is humble and gentle....calling us to Him, with open arms! It is then that we can find the rest we truly need. The rest that He offers is a rest for our souls, an inner rest that creates a calmness in knowing who is in control and that He loves us with an everlasting love. When we know and walk in this rest and truth...our faith is strengthened and we can be about our Father's business. The enemy hates it when our faith is strengthened and our minds are set on Jesus. The enemy loves it when we are trying to carry those heavy burdens ourselves, because it is then that we become weary and our attention can be diverted. What heavy burden are you carrying all by yourself? Are you weary and tired? Can you hear Jesus calling your name, asking you to come to Him and let Him carry the load for you? Go...go now and find the rest that is there waiting for you! I stumbled on your site while searching Google images for "an oxen with a yoke that is too heavy."! It was such a blessing to me and I have already begun to share your site with others. Keep up the Good Word! I, too, was looking for a pic of oxen in yokes... one of different sizes, and found your blog. keep up the good work of blogging God's great Word! Thankyou Mrs.Debra, I really appreciate how you explained Matthew 11;28-30.. I was looking of what yoke is and I can't understand it's meaning until I decided to look for it's image And then I see yours.. Thank you and be blessed! Thank you also for taking the time to share your encouraging words with me. I too...continue to have that vision in my mind and heart everytime I think of oxen or that wonderful precious verse. Hi Debra! Like LadyRose and catrina, I was also looking for a picture of a yoke....for a friend who felt burdened. Little did I know that God would remind me of my stresses today too, and how I needed to be reminded to rest on Him as well. Thank you for the wonderful reminder that He is strong, and I am not....and learning in Him is always the best way to learn. Well, your yoked oxen picture is the way we find you. I was looking for a pic of what 'appeared' to be the smaller one carrying the weight so your story cleared things up even though I thought the little one looked like quite a bit of weight was on it. Thanks for the information.